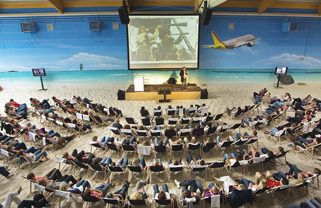 At the Beach Hamburg you find two Mediterranean designed halls (1.500 sq. m. and 800 sq. m.) with powdery and heated white sand. With over 3.000 sq. m. of space it is possible to create various event areas according to your wishes. 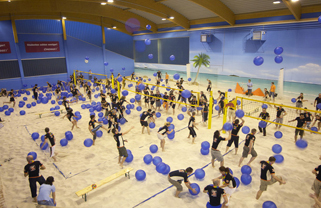 Experience the beach during the beach games or during a volleyball tournament and hilariously celebrate afterwards until the early hours. 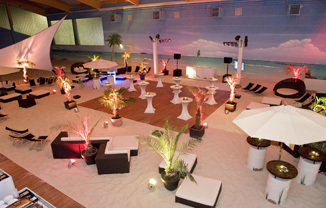 The team of the Beach Hamburg takes care of the details and makes sure things run smoothly. 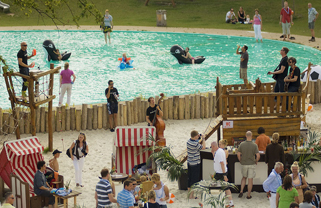 During summer the options are extended by the copious open-air bath and offer room for summer parties with up to 2.000 persons – nice weather guarantied.